Life as a mom of four is fast. Each day feels like it flies by with me running in a lot of directions to keep everything moving. One thing that I don't spend a lot of time on is my hair. I gravitate towards hair care and hair styles that are quick an easy. 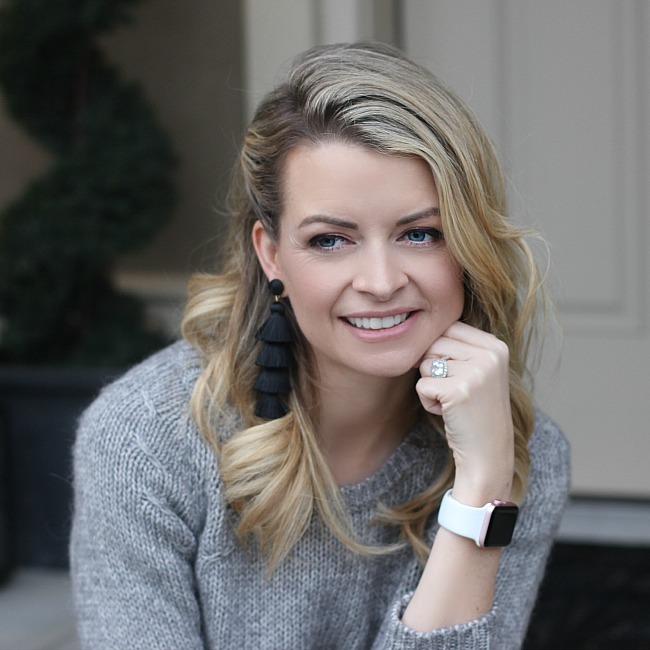 I look for products that are multipurpose that will help accomplish a lot of bang for my buck. Thankfully there are shortcuts I have found that help do just that. One of those shortcuts is Suave. Suave Professionals® Keratin Infusion Smoothing Shampoo & Conditioner has Kérastase® Oléo-Relax which helps to prevent frizz and allows your hair to be smooth and manageable. This shampoo and conditioner duo helps to fight frizz for up to 48 hours which allows me to skip washing my hair everyday but still keeps my hair looking smooth. With lower sulfates it is also a great product to use on your hair that will help keep it strong and damage free. Everyone loves to have great looking hair and thanks to Suave you can get frizz control to damage repair at a fraction of the price of salon brands with the Suave Gold products. I have put together this quick and easy tutorial to show you how you can get results you love with spending a fortune. You can #StayGoldwithSuave today. 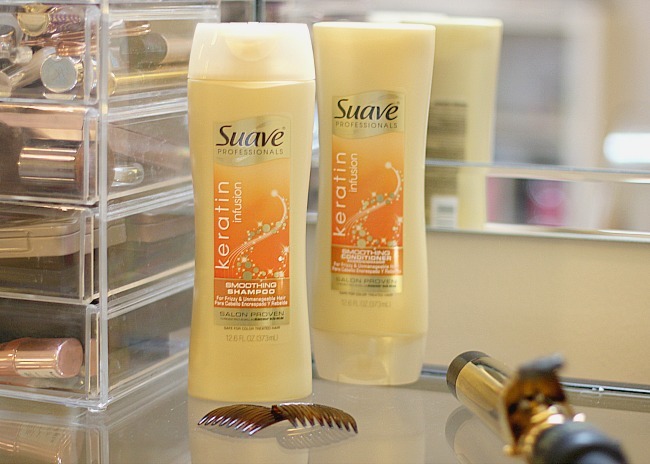 Start with washing and conditioning using your favorite Suave Professionals® Keratin Infusion Smoothing Shampoo & Conditioner. This will leave your hair smooth and frizz free and ready to style. 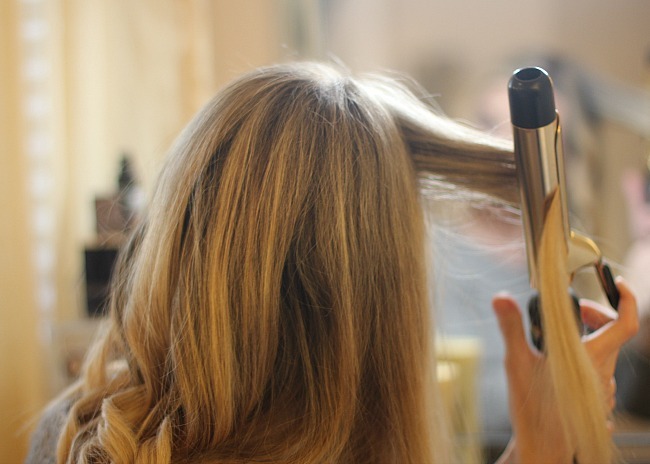 With a little help from some comb clips and a your preferred curling iron you can quickly style your hair. Rather than take the tedious task of pinning hair up and thoroughly curling, just quickly grab sections of hair and curl. 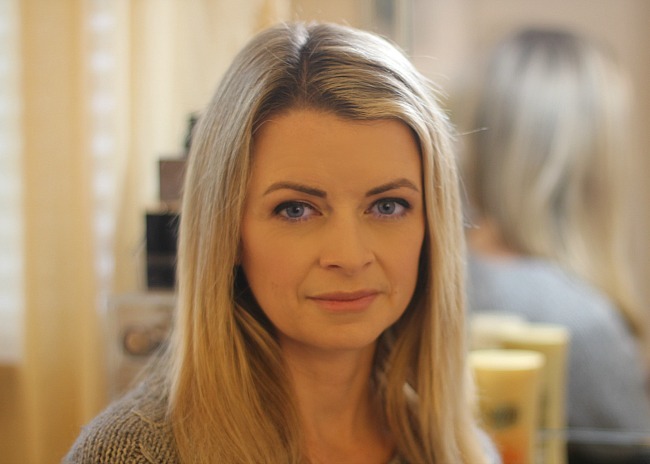 Not doing such a thorough job of curling will still leave you with great wave to your hair, increased volume and typically only takes just a few minutes. Curling my hair below took no more than five minutes, and we've all got five minutes to spare...right?! Using the comb clip I will deepen my side part and then pin back the hair. This pushes more hair volume to the other sections of hair getting you quick results with very little effort. Suave Professionals® Keratin Infusion Smoothing Shampoo & Conditioner allows me to shampoo and condition every other day which also helps save me time when styling. The frizz free results last up to 48 hours which means I can still get great hair without investing too much time. With this hairstyle I will pop on some statement earrings which amps up the glam factor quickly and easily. 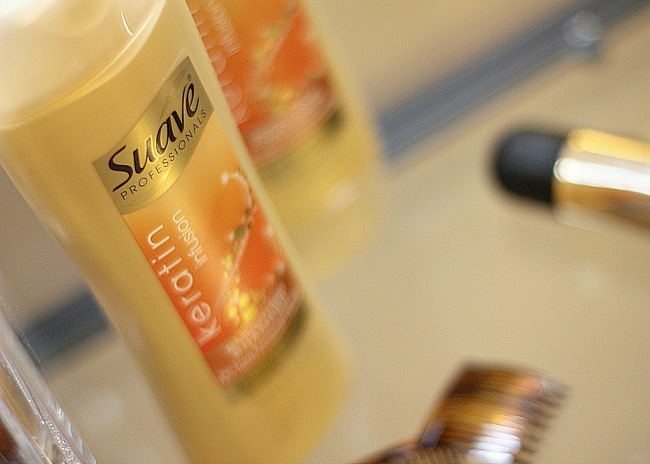 Right now there are some great promotions going on with Suave and CVS where you can get rewards for your purchase. From 1/28/18 - 2/3/18 you get $2 ExtraBucks® Rewards when you buy any TWO (2) Suave® Hair Care products or 2/$6 WITH CARD Select Suave® Hair Care products. During 2/11/18 - 2/17/18 there is a Buy 1, Get 1 50% OFF WITH CARD Select Suave® Hair Care products with $5 ExtraBucks® Rewards when you spend $15 on participating Suave® Hair Care products. Last they are also offering during 2/25/18 - 3/3/18 $5 ExtraBucks® Rewards when you spend $15 on participating Suave® Hair Care products and 2/$6 WITH CARD Select Suave® Hair Care products. These are all deals that you don't want to miss!